Cruising is one of the most pleasurable, relaxing vacations imaginable. Perhaps this is your first cruise or it’s your twenty first, with Magic Carpet Travel we care about getting you the best value for every dollar your spend on your cruise vacation. Cruising is much more than a journey, it’s an experience. Contact us and we will assist you in exploring the world! We are constantly looking for the best cruise deals for you. Make sure to check out our Cruise Specials. Cruising has become a popular vacation today because it takes away from the pressures and strains of contemporary life ashore, and offers a means of escape from reality. 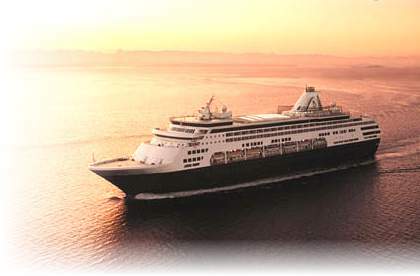 Cruise ships are self-contained floating resorts that take you to many destinations in the space of just a few days. Cruising provides a source of adventure, excitement, romance and wonder. Cruising is hassle free. When you’re onboard, virtually everything is taken care of. There are no hotel or dinner reservations to make, no theater tickets to buy, no car rentals to coordinate. 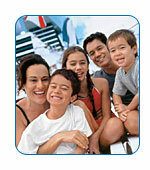 Since cruising is all-inclusive it makes easier and a convenient way to travel with families with children. It’s no wonder that 85% of cruisegoers want to go again, and again! 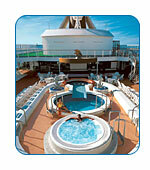 Singles, couples, families, honeymooners, group of friends, are all cruise goers. Cruising is about exploring the world. Whether you want to try new food, do something you’ve never done before, or see someplace you’ve never seen before, cruising brings out the explorer in all of us. A cruise ship is a floating resort. Everything you need is available and convenient. 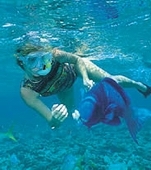 Cruising offers something for all ages and interests. Organized activities for children, entertainment options, gambling for adults, fitness equipment & classes, full-service spas and a variety of formal and casual dining to suit all tastes, and a variety of formal and casual dining to suit all tastes. 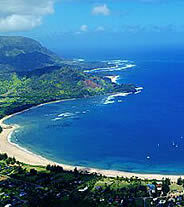 Cruising is great value and is relatively inexpensive compared to most land based vacations. One price includes: accommodations, meals, entertainment and most shipboard activities. On a cruise you just have to unpack once and you will visit a number of fascinating ports of call without the hassle of packing & using different means of transportation to see different scenery and places. Isn’t cruising mainly for older people? Nothing could be further from the truth. Indeed, the average age of cruise passengers becomes younger each year. Although older passengers have found cruising to be a very safe way to travel the world, the average age of the first-time cruiser is now well under 40. But do remember that older folks can have a lot of fun too! There is a lot to do on a ship. Your days at seas are filled with onboard activities. And you can do as much or as little as you please. So whether you want to lie back and be pampered, or indulge in all the activities, you can do it on a cruise vacation, and you’ll only have to pack and unpack once. Yes. 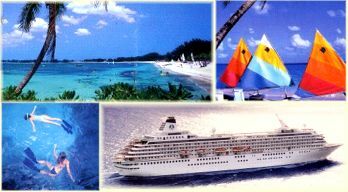 A cruise vacation is ideal for people travelling alone, since it is easier to meet other people in a non-competitive environment. Some cruiselines offer a special pricing for single occupancy and often they are able to find a cabin mate to share with upon request. Cruising is the ideal setting for romance, intimate dinners for two, strolling the decks at sunset and dancing the night away under the stars. Many couples are getting married onboard Ships. There are some cruiselines that specialize in this and having a Wedding Chapel onboard the ship that will arrange for receptions. "Sailing the open seas would be a wonderful way to spend your honeymoon!" Is cruising a good vacation for children? Cruising provides families with more quality time than any other type of vacation. 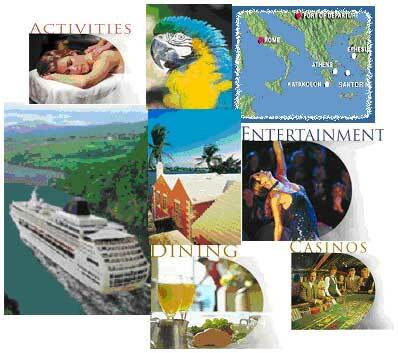 Activities on board are tailored to various age groups. In addition a cruise allows children to interact in a safe environment and takes them to destinations in comfortable & familiar surroundings. Your children may have a difficult time getting off the ship at the end of the cruise; and parents …you will be able to get quality time to enjoy. Choosing the right ship that caters to children is very important. Are there different classes aboard the ship? Today the cruise ships are all one class. However, prices are charged according to the stateroom size and location. Aren’t all ships & cruises quite similar? No! Ships range from under 200 feet to over 1,000 feet in length. They carry from under 100 to over 3,000 passengers. Facilities onboard vary from each ship as well. Some offer more, others less depending on the size of the ship. deals for you. Make sure to check out our Cruise Specials! Sign up for our free travel newsletter!